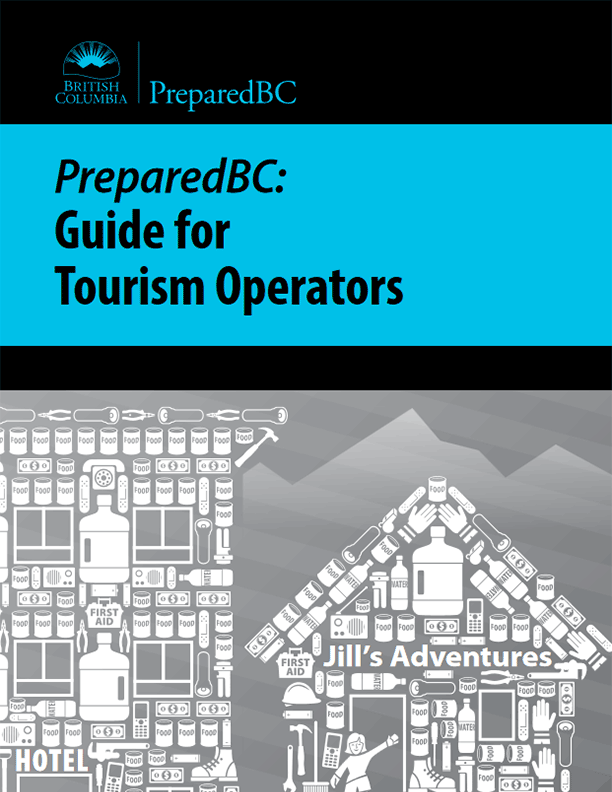 When natural disasters strike, tourism operators play a vital role in providing information, direction, and guidance for tourists and visitors unfamiliar with BC and its potential hazards. Below you will find many industry-specific resources available for your use in preparing for emergencies when they occur, including ways to prepare for tsunami, wildfire, flood, wildlife encounters, avalanche, and other natural and recreation-related risks. Check out drill manuals and preparedness guides and plans, BC-wide safety awareness events, and channels to stay connected with the most up-to-date weather and emergency alerts. Follow this step-by-step guide to prepare your operation and staff for emergencies: know the risks, make a plan, have key contacts on hand, stock up on materials and supplies, communicate with and train employees on emergency responses, conduct practice and drills, and more. Use these templates, tools, and checklists to begin the process of planning and preparing for emergencies that may impact staff and guests. Article: Victoria Double Tree by Hilton Hotel conducted a full hotel evacuation exercise as part of ShakeOut in partnership with Emergency Management BC and the Victoria Fire Dept. High Ground Hike: In British Columbia, Tsunami Preparedness Week is held the second full week of every April. Hosting a High Ground Hike is a great way to recognize the week and engage residents and visitors on the subject of local tsunami risk and proper response. Emergency Preparedness Week: first full week of May each year. Great British Columbia ShakeOut: annual October event. Water Recreation: includes boating, fishing, surfing, SCUBA diving, etc. Land Recreation: includes mountain biking, hiking, horseback riding, ATV, etc. Winter Recreation: includes snowmobiling, Alpine skiing, Backcountry skiing, Nordic skiing, etc.